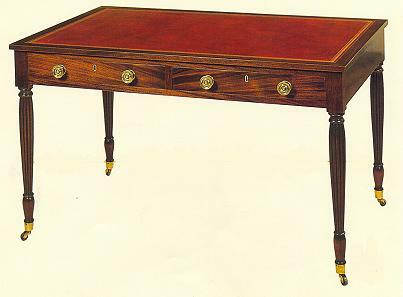 Flat top writing desks were made in large numbers in England during and after the reign of George III, the the form is exceedingly scarce in American furniture. The few known examples were all made during the Federal period, and are mostly in the Sheraton style. The American Federal ClassicsTM replica Sheraton writing desk is reproduced exactly from a documented original New York Sheraton writing desk attributed to Duncan Phyfe, one of America's most noted Federal cabinetmakers. The replica desk, like the original, has an inset tooled leather top above an apron fitted with two drawers on either side, and has superbly shaped, turned and reeded legs ending in the typical New York bulbous foot with brass cup casters. Select South American mahogany is used in this fine desk, which has the identical construction details and secondary woods as the original. Its perfect proportions are aptly complemented by the hand-rubbed natural shellac finish which highlights the carefully " book matched" solid mahogany drawer fronts. This unique and desirable American form is ideally suited for use in a home office or in a sophisticated corporate environment where aesthetic considerations are paramount.